Magnet fishermen haul weapons out of Midlands' canals. M6 Warwickshire southbound severe accident, from J3 for A444 Nuneaton to J2 for Hinckley Road J2. M6 Warwickshire - Lane closed and slow traffic on M6 southbound from J3, A444 (Nuneaton) to J2, Hinckley (Coventry), because of an accident involving three cars. Jordan Willis grabs the only goal as Coventry earn back-to-back league victories for the first time this season against Barnsley. M6 Warwickshire - One lane closed and slow traffic on M6 southbound from J3, A444 (Nuneaton) to J2, Hinckley (Coventry), because of an accident. A man has died and a second left seriously injured after a car hit two pedestrians in Nuneaton today. One of the pedestrians was confirmed dead at the scene, after the crash in Ansley Road, Stockingford, shortly after 10:30. A second man was taken to hospital suffering serious injuries. The driver of the car, a man believed to be in his 50s, appeared to have avoided serious injury but was taken to hospital for further assessment, the ambulance service said. Network Rail engineers are "working around the clock to recover the train and repair any damage ". Travel disruption caused by derailed wagons will continue right through the weekend. There will be no trains between Birmingham New Street and Nuneaton until the end of service on Sunday, according to National Rail. Services between Birmingham New Street and Leicester/Stansted are affected. 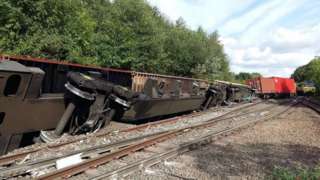 A number of freight wagon overturned on Wednesday, blocking the line between Coleshill Parkway and Nuneaton. National Rail Enquiries says replacement buses are running along the route and passengers need to check train schedules before they travel. 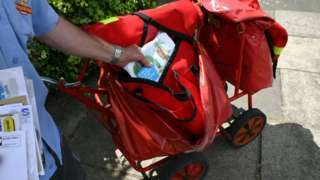 Royal Mail says it will not resume deliveries at the block of flats until it is safe. The rail line between Birmingham New Street and Nuneaton is now expected to be closed until Monday, said Network Rail. The line was closed after a freight train derailed at Coleshill Parkway on Wednesday. Cranes are now being used to lift the wagons off the tracks. M42 Warwickshire northbound severe disruption, at M42 J9. M42 Warwickshire - One lane closed on M42 northbound at M42 J9, Curdworth, because of a broken down vehicle. M6 Warwickshire northbound severe disruption, between J2 for and J3 for A444 Nuneaton. M6 Warwickshire - One lane closed and queuing traffic on M6 northbound between J2, Coventry and J3, A444 (Nuneaton), because of a broken down vehicle. The British Science Festival will be held in Coventry next year for the first time in its history, it's been announced. In collaboration with the British Science Association, the University of Warwick will host the event from 10 to 13 September next year, in the run up to Coventry hosting the UK City of Culture in 2021. The festival will feature a programme of talks, debates, performances and activities on campus followed by a one-day family festival in conjunction with partners, said the university. If you were up early this morning in the West Midlands, it looks like there were some cracking conditions for great sunrise photos around. Road closures have been put in place after a serious crash in Nuneaton, say police. Nuthurst Lane is closed between the Ansley Road junction and Park Lane in the town. The road is expected to be closed for some time, said Warwickshire Police. Speaking yesterday in Parliament, North Warwickshire MP Craig Tracey encouraged the further roll-out of body-cameras among prison officers following "very positive results" among the police and other emergency services. 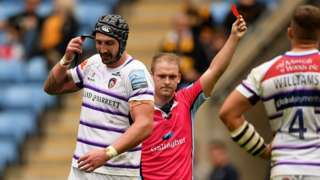 In response, Prison Minister Rory Stewart said a camera "allows evidence to be gathered, allows the prosecution to happen and makes it less likely you're assaulted".